Having about 10 thousand sqm covered facilities in Gedelek, our company produces 8 thousand tons of pickled products and sauces under Berrak brand for export markets and for several international food brands along with major fast-food chains worldwide. Earlier pickles and olives, a traditional item in Turkish cuisine, had been prepared by individuals or by small businesses by applying their ancestors’ recipes. There was a growing demand for healthier and quality pickles when our company had been established in 1983. 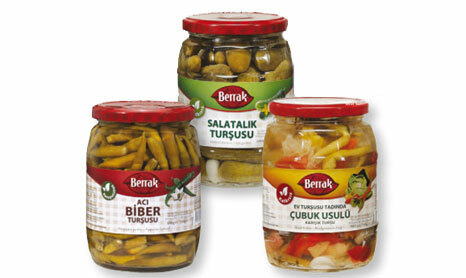 We produced Turkey’s first pasteurized pickle in Gedelek, Bursa. With its quality products, the products and the brand of the company, Berrak, earned a good reputation in domestic market. 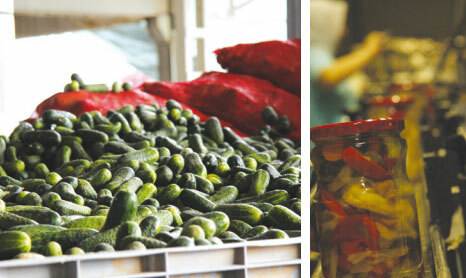 Then we started to export our products, Turkey’s first German style sweet pickles. At the beginning of nineties, with its growing fame on dining tables, the company was partnered by Poupon Reitzel, Switzerland’s centennial vinegar based food industry giant, to increase its production capacity and become a lasting brand in export markets.During its growth, the company began to penetrate in the famous supermarket chains in Turkey with Berrak brand. Some leading fast-food chains signed contracts to by pickles. In line with growing domestic and international demand the company expanded facilities and production capacities up to annual amount of 8 thousand tons. The latest facility in Gemic village on 82 thousannd sqm land having 13 thousand sqm covered plant has been operational in 2013. The facility, located just nearby the field that supplies 40 % of Zey-Tur-San’s own raw material needs. Pasteurized pickles are ours major product category. We made pickles from almost every vegetables, besides, we produce and process green/black olives and sauces. As a family business Ersoy, we have been in food business since 1945. Presently, 60 % of our production is sold in domestic and 40 % is sold in export markets. We buy raw foods from Afyon, Izmir, Balikesir, Eskisehir, the Trace and Canakkale. We also have our own fields to produces vegetables for pickling. We also produce, cooked products, sauces and green olives. We sell our products to 27 countries, including, Switzerland, Germany, England, Denmark, Azerbaijan, Kazakhstan and Middle East countries. Food safety, certification and process control are important issues in our business since we are dealing with food products. We have high paid and compulsory food safety certificates necessary for exports. We also will be happy if state incentives would be increased and eased provided for market research, promotion and advertising activities. Also, some of the red-tape in exporting should be removed to facilitate and increase the volume of exports. A very good day to you. I am an import manager from Russian Comampany Rubin Ltd. We’re interested in pickled and preserved vegetables, basicaly in zucchini and bush pumpkin(patisson). Would be very pleased to get a commercial offer from you.